A listener pointed me to some comments from an atheist on his blog, and asked me to give a response. This brought the program today into the realm of apologetics as we discussed some of the reasons for believing that the resurrection of Jesus is an actual historical event. Excellent presentation, Pastor Cooper. Thank you very much. I would like your readers to have some background about "DagoodS", the atheist whom you spoke of in this podcast. DagoodS grew up in a devout Christian family. He and his wife were Sunday school teachers and very involved in their evangelical Christian church. However, DagoodS made the same mistake that I did: he was surfing the internet one day and happened onto an atheist blog. He felt confidant enough in his knowledge of the Bible, that he made the fateful decision that he was going to "blow those atheists out of the water". He started to debate them. Instead of blowing the atheists out of the water, his belief in an inerrant Bible was shattered by the information provided by the atheists. "The genie was out of the bottle" and as hard as DagoodS tried, he couldn't get it back into the bottle. He prayed and prayed, begging God to take away his doubts and to restore his faith. He was absolutely heart broken. However, one morning, he woke up, looked into the bathroom mirror, and realized he no longer believed in God. He had become an atheist. DagoodS is not a God-hater. He is not a Christian-hater. I personally believe that DagoodS is still sad about his loss of faith. He describes being "resigned" to the facts. I believe that DagoodS has done so much research on atheism and the "discrepancies" of Christianity, not for the purpose of attacking Christians, but because he is seeking that ONE piece of evidence that will convince him that Christianity IS true after all. DagoodS is an attorney. He is very smart and very well studied. He is looking for evidence of the Resurrection that would convince a neutral jury that Jesus of Nazareth really did rise from the dead. I very much hope that DagoodS will come onto your blog and discuss the Resurrection evidence further with you, Pastor. I sincerely hope that you're right about his attitude, because to be honest, most atheists maintain their position of denying God's existence because of desire rather than intellectual reason. R.C. Sproul once remarked about a lecture he was giving to many atheists, and he told them point-blank that "many of you, if you are honest, do not WANT God to exist." Of course, this angered some of the students, but Dr. Sproul's point concurs with both Scripture (Romans 1) and my own personal experience. It's interesting to see their reactions if you ask them how they would react if it were proven beyond doubt to them that God did exist. Good podcast, Jordan, and I'm pretty much the same with atheists that you are: if the topic comes up, I'll state my position as a Christian, but beyond that I generally don't get into debates about it, usually because the atheist conceives whatever excuse he can to deny the existence of God. And as Jesus said, "Let them alone, they are blind leaders of the blind." Well…I listened to the podcast. Twice. Nothing really surprising or new here. My biggest question after listening would be this—why the inconsistent methodology? Why is the very same argument utilized to bolster one claim but then considered illogical, non-sensical or silly when the opposing person uses it? Pastor Cooper takes issue with my statement the actual evidence regarding an empty tomb is a written account in Mark, dated from 70 CE – 113 CE. He disagrees both with the fact it was the earliest AND the dating of Mark. Fair enough. Pastor Cooper relies upon 1 Cor. 15 to claim Paul implied (although did not directly state) there was an empty tomb by stating Jesus was dead, buried and then raised on the third day. I think it correct—if Paul believed Jesus was physically raised with a slightly modified but same basic body Jesus had before death, then 1 Cor. 15 more likely means an empty tomb. So the method is this: Since Jews did not claim a spiritual resurrection, then Paul would never claim a spiritual resurrection, therefore Paul would never have come up with the belief in a spiritual resurrection. But wait…aren’t we also told Jews would never come up with a dying Messiah, and therefore the disciples would never make it up, so therefore it must be…true? Which is it? If it was something the Jews would never have come up with (spiritual resurrection or dying messiah) and the someone is claiming it occurred (spiritual resurrection or dying messiah) must it therefore be false (spiritual resurrection) or true (dying messiah)? Do you see how the method changed to conveniently fit the apologist’s desired outcome? But..when I claim Paul doesn’t list any events in Jesus’ life (other than the Eucharist and 1 Cor. 15 tradition), and it would naturally bolster his doctrinal arguments (such as love, divorce, eating food, resurrection, giving, etc. ), it is because he doesn’t know the Jesus legend as developed in the gospels, because it hasn’t been created it—Pastor Cooper says this is an illogical argument? Huh? Acts not listing means it hasn’t happened yet; Paul’s not listing means he is conveniently not using it as it doesn’t suit him. This is what I mean by inconsistent methodology. Personally, I wouldn't waste too much time on atheists. I mean, after all, they saw Jesus raise the dead, and yet they did not believe. 1. )"Pastor Cooper takes issue with my statement the actual evidence regarding an empty tomb is a written account in Mark, dated from 70 CE – 113 CE. He disagrees both with the fact it was the earliest AND the dating of Mark." 2.) His second section regarding I Cor 15 is nothing more than loose assumptions fitted to philosophical jargon. For starters, he is forgetting that by the time of Christ, the Jews had many theological misgivings that can be easily corrected by a proper reading of the Old Testament texts regarding Christ. He's falsely equating what the Jews believed with what is to be completely true according to the Scriptures. This is slipshod arguing: anyone with a decent sense of reading comprehension who looks at the New Testament will see that the Pharisees and Sadducees were rebuked by Jesus for bad doctrine and practice. It's basically using overgeneralizations as a starting point in order to set up a straw man argument. 3.) Notice his insertion of liberal higher criticism in an attempt to force at least a tacit acceptance of a wholly unproven theory ("Additionally, as Luke and Matthew rely upon Q, Matthew must be before or at Luke"). What he's doing is playing a little trick used in political arguments to paint the opponent into the corner by making them accept a false premise which suits their argument ("Since global warming exists..."). It's insidious for two reasons: 1.) there has NEVER been proof of a Q document; the Q document is a theory invented in order to destroy the inspiration of Scripture which has never been proven, and 2.) this fellow, in doing so, has ceased to take the high road in his argument, and is resorting to devious tactics in order to make his point. 4.) His final two paragraphs are an absurd and irrelevant conclusion. Again he makes a non-sequitur premise followed by an unreasonable argument. Paul was writing to believers, and was reinforcing what they had already learned. He was not there to re-teach them the gospel and the life of Jesus. And frankly, this is an absurd point. This is like me teaching a trigonometry class and somebody coming in and criticizing me about my math knowledge because I did not re-teach the class that 2+2=4. It's not necessary for the course, because it's assumed prior knowledge. The Corinthians were ALREADY Christians. They were already given the gospel, and logic dictates that they already knew something of the person and work of Christ. That was not a necessary thing to talk about in this letter, especially when the crux of the letter was to take care of ethical problems in the church concerning other matters. I mean, really-does this guy even understand the irrelevance of this pseudo-intellectual talk? I'm sorry, but in the end, I'm forced to go back to my previous premise: I don't think this guy wants to believe in God, because a person who truly wants to believe will look at things through a far less jaundiced eye and not nitpick anything and everything in a desperate attempt to hide behind denial of God's existence. Funny thing related to this: Lee Strobel was on the radio one time talking about his conversion, and the question came up as to how Christians should deal with their doubts. After answering the question, he added (and I am paraphrasing) that atheists don't like to talk about the fact that a great many of them doubt their position more than they are willing to admit. That was a very revealing thought. So I pray for atheists, even for people like DagoodS who seem to try to argue their way out of belief. But arguing with a man about the existence of the sun when he refuses to open his eyes is a problem that only the Holy Spirit can fix. One minor correction: In his epistle to the Galatians, Paul wrote that he confirred with Peter and James in Jerusalem THREE years after his conversion (Gal 1:18) and then went to Jerusalem AGAIN fourteen years later (Gal 2:1). One can also look at the early apostolic sermons of Peter and Paul, recorded in Acts 2 and 13 respectively--which both quote Psalm 16 ("You will not allow Your Holy One to see corruption") and then contrast King David 'seeing corruption' to Jesus 'NOT seeing corruption'--as evidence that from the earliest times they were preaching a PHYSICAL resurrection (with the implied empty tomb). Dear Pastor Cooper, Use your discretion whether you want to post this or not. It is for your info. I would prefer that you keep it to yourself. If you want to post it, delete this first paragraph. 1. I believe that the Old Testament god was an invention of ancient superstitious, barbaric, nomadic people looking for an excuse to slaughter men, women, and children to take the land they coveted. I do not believe that this god is my God. That god would be a sick monster...but he never actually existed, except in the minds of an ancient, superstitious, war-mongering Mediterranean people. 2. I do not accept the authority of Churchmen in the first five centuries AD to tell me what are and are not the very Words of God. Jesus never gave a list of which books would contain his words and teachings. This decision was made by men. The men who chose the books of your Bible were NOT under inspiration to choose the canon of the NT. 3. Therefore, since I do not believe we can know what are or are not God's Word in the 27 books of the NT, I do not accept the teachings of anyone other than Jesus...including Paul. Therefore my previously held positions on gender roles in the Church, sexuality, and others issues not covered by Jesus, have now been tossed out the window. 4. I am still waiting for Pastor Bombaro or someone else to convince me of the evidence for the PHYSICAL resurrection of Jesus of Nazareth. So for now I am a "Red-Letter" Christian: I only hold to the teachings of a risen Jesus, minus any Greek/Hebrew superstitions regarding the after-life." "Gary" is listening to his atheist friends. From following him, I think he has wanted to flip a long time ago. I know you're busy -- but in case he tries to appeal to you again, you can use your judgment. Thank you for sharing this information, sgl. A liberal Christian sent me an email yesterday that said this: If your theology does not cause you to be more loving and kind to other people, then there is something wrong with your theology. I challenge any of you to go onto two of the most popular LCMS Lutheran blogs (Brothers of John the Steadfast and Cranach, the blog of Veith) and see how much "love your neighbor as yourself" you will see. Not much. Instead you will see a lot of judgmental, really nasty, mean-spirited people who want to tear down and destroy anyone who isn't exactly like them. It does appear that you have already abandoned the Christian faith at this point. I don't feel like getting into a long heated debate with DagoodS regarding his assertions, especially since it does not appear that you are actually looking for answers. From your blog posts, it has become clear that you have rejected the orthodox faith. Sadly, you are correct in dropping interaction with Gary. He is not listening and does not want to expend any effort in clinging to (or even being impartial to) the faith he once proclaimed. He is actively a scoffer. Upon reading your comment above on his site, he has implied strongly that you are a flat earther. Though he cuts and pastes everything he finds against the faith, he has not even spent five minutes searching the web to verify his accusation. In five seconds I could find this, and this. Nor can he be bothered to read a thorough book on the Resurrection such as N. T. Wright since "it doesn't take 1,000 pages to prove a historical fact." Well, one hotly debated probably would. But Gary wants none of it. As you said, his mind is made up. He mocks those that try to help and wars against the faith. He reminds me of Hebrews describing those who fell in the desert (something he also denies historically) and those who have made a shipwreck of their faith. It has made me cling more to Christ in fear. Warning. Taken. 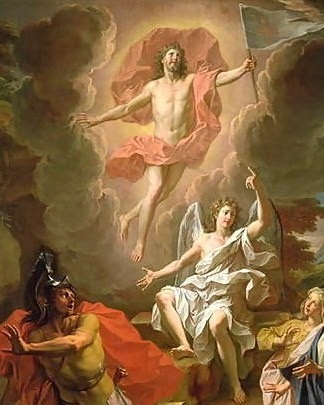 This stuff about questioning the _physical_ resurrection is nonsense. The idea that someone might confess believe in "resurrection," but secretly mean that the spirit lives on with God, or that the man "lives on" in some figurative sense in the lives of his followers, comes from modern liberalism, not from the ancient world. The Greek word for resurrection is anastasis. It literally means, "standing again." When someone dies, their body falls down. When the anastasis happens, it stands up again. Similarly, the Latin word "resurrectio" means "rising again." There was no confusion among the ancients what the word meant. When St. Paul was preaching to the philosophers at Athens, it was his claim that God would judge the world through a man (Jesus) that He had raised from the dead (ἀναστήσας αὐτὸν ἐκ νεκρῶν) that led many of them to mock and ignore him. But the idea that the soul would go on after the body was dead was a familiar idea in Greek philosophy. In fact, the idea that the souls of particularly wise and just men (Minos, Rhadaminthus, and Aiakos) would judge the dead was a tenet of Greek paganism. So if that was a possible meaning of "anastasis" to Paul's contemporaries, why did they assume instead that he was teaching something ignorant and philosophically ludicrous, like that a dead body might stand up again? It's from 19th and 20th century liberals, not from 1st century thinkers, that we get this strange insistence that it's possible to believe in "resurrection" without believing in PHYSICAL resurrection. That kind of doubletalk requires a distance from the original languages and their thought-worlds, and--more importantly--a deep-seated need to convince onself that one is affirming an ancient and beloved religion when actually one is doing the opposite. "Physical resurrection" is a redundancy. In some cases it may be a redundancy that promotes clarity, like "free gift" sometimes is, but it's ridiculous for people to argue, as above, "Sure, it affirms _resurrection_ but not explicitly _physical_ resurrection."